The average employee sends about 38 e-mails a day. Could those be wasted marketing opportunities? That’s the thought that occurred to Sean Guerin, co-founder of U.S. Imaging Solutions, a Davie, Florida–based company that sells and services copiers and printers. Guerin decided to try WrapMail, a service that slips advertisements for his company’s products into the e-mails his 60 employees send to customers, vendors, and friends. Now, all of Guerin’s employees have become de facto members of the sales team just by keeping up with regular correspondence. 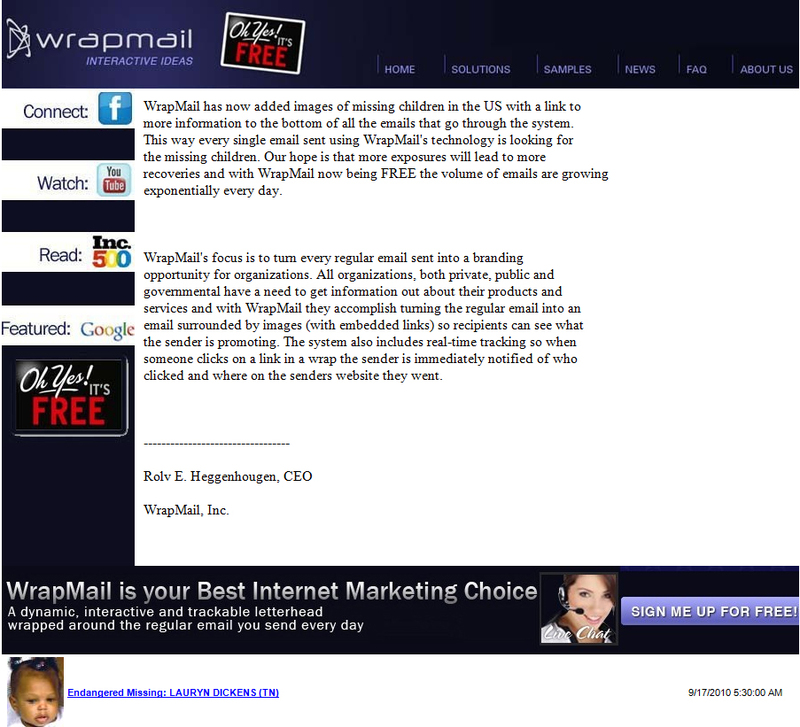 As the name suggests, WrapMail takes an outgoing e-mail message and wraps the borders in clickable images. Companies create banner ads, add them to a template, and specify which webpage should appear when someone clicks on an ad. Employees don’t need to install anything — the ads are automatically added after they hit Send. For companies with fewer than 200 employees, the service, which costs $5 per user per month, routes outgoing e-mail through WrapMail’s servers. For larger companies, it’s an additional $3,000 to install a WrapMail server on-site. Guerin saw results right away. In the first week, someone who clicked on an e-mail banner ad bought an $8,000 printer. The e-mail in question? A reply Guerin had sent to a friend, saying he would attend a dinner party. Guerin’s friend forwarded the RSVP to the host, who happened to work at a photography studio that needed a new printer. Guerin was so impressed that he later joined WrapMail’s board. There is some evidence to suggest that everyday e-mails make for a persuasive marketing platform. According to a survey by Forrester Research, 77 percent of people say they trust the information in e-mails sent from people they know. That ranks well above the 46 percent who trust what they read in newspapers. And whether or not recipients fully trust the ads in e-mails from acquaintances, they at least look at them. WrapMail claims that nearly all of the e-mails sent with its service get opened. A typical e-mail marketing newsletter, in contrast, is lucky to get a 50 percent open rate. The e-mail ads may be especially effective in niche markets. Tim Davey, president of Global Marine Travel, an agency based in Fort Lauderdale, Florida, that arranges flights for people who work on oil rigs, cargo ships, and private yachts, says WrapMail helps the company target its marketing efforts. Because airlines offer these workers special discounts through Global Marine, the company doesn’t widely publicize its promotions. “We spend about 50 percent of our time turning down people who aren’t qualified to use these fares,” says Davey. About 24 of Global Marine’s 78 employees get ads placed on outgoing messages — about 500 e-mails a month — to cruise-line executives, yacht owners, and other travel agencies. About half of all recipients click on the ads, says Davey. WrapMail allows each recipient to opt out of the ads and receive just normal, plain-text e-mails. And a company can omit the ads for contacts who receive frequent e-mails. But Guerin isn’t worried about his ads getting on people’s nerves. “You can’t hit people over the head hard enough when it comes to making them aware of the products you offer,” he says. Copyright © 2009 Mansueto Ventures LLC. All rights reserved. Inc.com, 7 World Trade Center, New York, NY 10007-2195. Email marketing and customer relationship management on demand will be among the largest program allocations by technology companies by 2010, it has been claimed. Research carried out by IT industry analyst IDC indicates there is currently a gap between what is being communicated to an audience and what consumers require. The group added that with restricted marketing budgets and a continued focus on efficiency, effectiveness and return on investment, technology marketers and sales now need to focus on tactics that yield results. Ms Nurzynski went on to say this requires coordination across the entire go-to-market chain, from market research to how the sales team is enabled. Earlier this week, e-commerce advice group FuelNet claimed global firms are increasingly turning to email marketing in an attempt to attract and retain customers while cutting advertising spend.